We held our 10th anniversary gala dinner on the 8th of October, where we launched The Hope Project, our non-profit initiative with the vision of making world class services for autism accessible to all. Here is a feature by Bernama, who was present at our gala dinner. 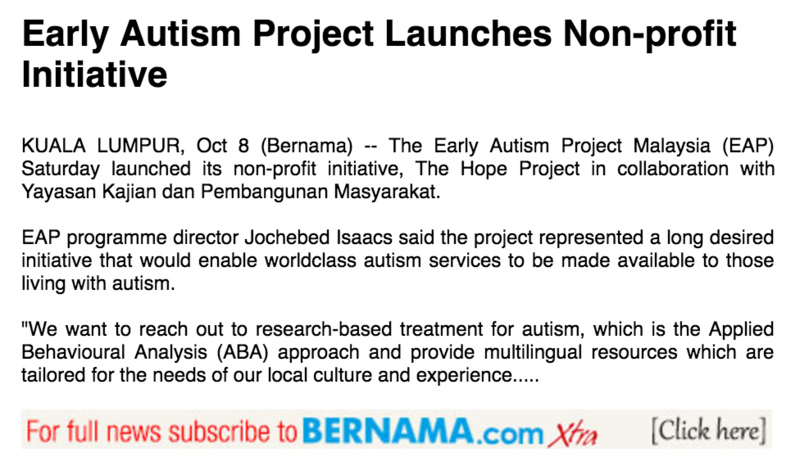 The Early Autism Project Malaysia (EAP) Saturday launched its non-profit initiative, The Hope Project in collaboration with Yayasan Kajian dan Pembangunan Masyarakat. EAP programme director Jochebed Isaacs said the project represented a long desired initiative that would enable world-class autism services to be made available to those living with autism. To view the full article, subscribe here!